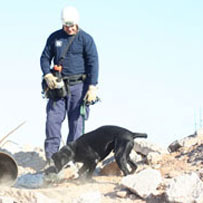 The Phoenix Fire Department’s urban search and rescue team will not go to New Zealand to help with earthquake recovery, but the team still spent Wednesday morning training its search dogs to deal with disasters. A firefighter was lowered into a hole under concrete rubble in Tempe and it was up to a black lab named Big Ben — after Pittsburgh Steelers’ quarterback Ben Roethlisberger — to find the trapped man. “Ben Roethlisberger actually donated dog food for a year and 15 annual physicals for our dogs,” said Fire Capt. John Dean. He noted Big Ben found his man in a matter of seconds, while it could have taken firefighters minutes or hours. The Pittsburgh area grants will be announced in early March and applicants will be notified! To contact The Giving Back Fund, click here.